Think about the amazing tools we have in our tonal arsenal today. Overdrive, reverb, modulation, and specifically tremolo. Each device adds to the line array of weaponry all delivered through amplifier or pedal. Never have there been so many options available. Of all these different tonal effects accessible to the modern player, non-is so interesting as modulation, specifically tremolo and vibrato. Sounds that have spawned timeless classic genres, from roots, blues and rockabilly, through to audiogasms produced by modern sonic adventurers. We’ll start by talking about Tremolo. By which we mean the oscillation of the volume of a note and not the pitch. A great example of a modern tremolo sound can be heard at the beginning of ‘Boulevard of Broken Dreams’ by Green Day. When we say Vibrato, then we mean the attenuation of the pitch of a note, to create a varied tone. Literally, it means to vibrate in Italian. Think about BB King’s almost sensual relationship with his beloved Loucille; from soft wailing to her banshee-like howl. Throughout modern history, Tremolo and Vibrato have been at the centre of much confusion. To some extent that’s to do with a certain Leo Fender when he named the whammy bar on his Fender Stratocaster a tremolo. A pinnacle moment, encapsulated in time, leaving many guitarists bewildered for decades to come. To make matters more confusing, the whammy bar on your guitar actually produces a glissando (a smooth glide from one pitch to another, there’s no correspondence to timing). But we have to give old Leo some slack here. This is not just a case of getting your lefts and rights mixed up; the confusion goes back a long time ago. It’s believed that the first stringed instruments were developed in the Byzantine Empire. An Empire that lasted over 1000 years, and way after Rome crumbled. It was land rich in literature and culture, with its capital now situated in modern day Istanbul. Carvings from around 900 AD show stringed instruments being played by a cherub, most likely to be a lyra. It’s very possible that the tremolo effect was first used as a technique at this time. However, the first ever record of a mechanical tremolo came around in the sixteenth century. Most poignantly the undulating effect; specifically developed by pipe organists in churches. During this period the development of new mechanisms gave way to the inception of this effect. A great example of which can be found in the San Martino Maggiore church in Bologna. Varied air pressure by opening and closing the diaphragm produced a truly unique sound. But there was a problem; a change in pressure also changes pitch. So it didn’t reflect a true tremolo sound. By the late 19th century manufacturers were getting close to the tremolo solution on piano and woodwind. As you can imagine, this involved some very inventive but protracted ideas; revolving fins and spinning mechanisms like you’d expect to see from some direct to VHS horror B-movie. Although Danelectro created the first true tremolo guitar amp in 1947, they were pipped to the post on the market by Multivox’S ‘Premier ‘66’ and Gibson’s GA-50T, being released in 1947 and 1948 respectively. Early versions were significantly different from the types of tremolo systems we have these days. The very first types varied bias by using one single 12AX7 tube, which then housed two separate triode tubes, used independently to modulate the voltage. An example of this type of tremolo effect can be heard on old Muddy Waters tracks. Around the 1959’s manufacturers took a different approach, such as the Fender Brownface range by modulating a power tube, a bit like how overdrive works. 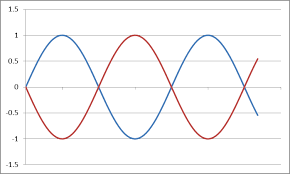 Simply put, imagine a sine wave with its peaks and troughs. Then overlay a second version of that signal and invert it by 180 degrees. What you get when those waves cross is phase cancellation and volume attenuation. You can experience something similar when you watch a live band. Some places in the room the volume will be exaggerated and in other places it sounds muted. The sine wave tremolo effect is often preferred for its subtly, because of its smooth often-imperfect undulation. ‘Crimson and Clover’ by Tommy James and the Shondells is a great example of a signal oscillating tremolo effect. Phase shift Tremolo effect was soon replaced by a totally different system as seen on the Fender blackface amps from 1963 onwards. Using a photocell, a neon light would switch on and off to change the voltage on the 12AX7 phase inverter tube (the last part in the amplifier signal chain). This created a choppier sound than the bias variation tremolo. Check out ‘Riders on the Storm’ by the Doors or ‘How soon is now’ by The Smiths for examples. Often referred to as a triangle waveform tremolo, the photocell is now commonly used in many tremolo pedals. They are precise, rising and falling in a linear fashion making it musically pleasing to the ear. 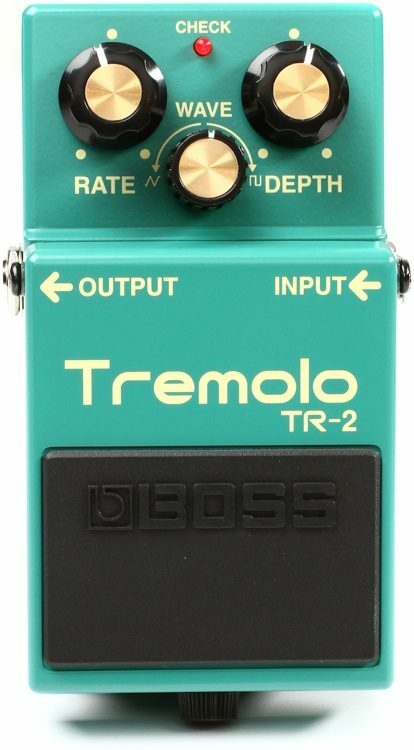 Examples of triangle waveform tremolo pedals include the Boss TR-2. The story of tremolo is the perfect illustration of evolution of sound. Tremolo has the ability to dynamically change the feeling and flow of your music with just two simple pots. If you’re looking to create depth and movement your chords simply alter the intensity. For choppier sounds or to sync up with the tempo of a song, then speed function gives you all the flexibility you’ll need. That weapon, the tremolo. That underrated producer that helped spawn hit after hit; we all thought he was called Dave. 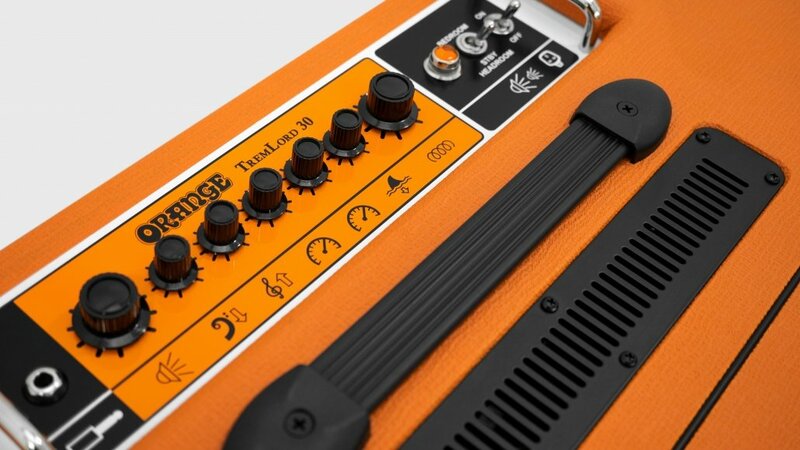 For more about the Orange TremLord 30 click here. Stringed instruments are thousands of years older than the Byzantine empire. They’re at least as old as Mesopotamia, which means they existed for at least three millennia before those Byzantine cherub images. Chances are they are far older still — some believe the 15,000-year-old cave paintings at the Trois Frères cave in France depict a primitive musical bow. How would you use the Pedal Baby 100? Interview: Mike Vennart from Vennart.